The beginning of 2013 was marked by an important event for Mariupol State University in the field of international cooperation. 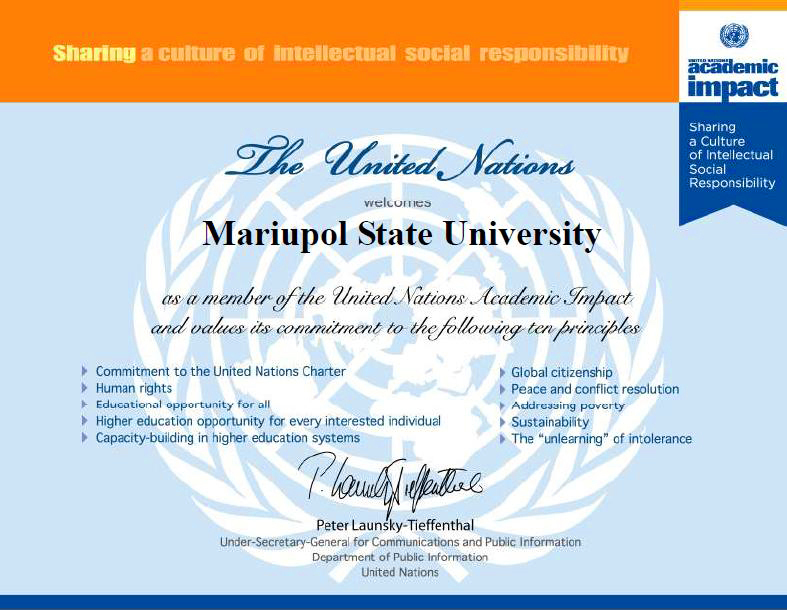 MSU received a Certificate verifying joining the United Nations Academic Impact Program that is aimed at enhancing cooperation of the higher educational institutions with the United Nations, as well as among themselves. We congratulate a Paralympic prize-winner Daniel Chufarov on the order “For courage”! is decorated with the order “For courage” Second Class. The staff of Mariupol State University sincerely congratulate the graduate and Olympic sportsman on receiving a state award! We wish you further victories and boundless energy! Dean of Economics & Law Faculty Lyudmyla Nikolenko – the winner of the citywide contest “The Person of the Year 2012 (Mariupol)"